Contest closed. Congrats Heather T! Hi everyone! I thought it might be fun to give away a small prize package to a lucky reader 🙂 Plus I’ve been blogging on Bunny Cookie since last year and it seems like a cute way to celebrate! US entries only though, sorry guys! There’s lip balms, nail polishes, glosses, shimmer gels, a lip frosting, and even a couple of older smacker key chains! Log in below via facebook or with your email address and then you can enter by leaving a comment on the blog, tweeting etc. You can earn up to a total of 6 entries in the drawing. Once you do a task make sure you click complete on the entry form so it counts. It’ll automatically pick a random winner when the contest is over. I’m not sure how it looks on mobile so if you can’t see the contest, please try using a computer. I hope you guys like it because I want to do more giveaways in the future! O_O amazing, i hope i win!! This is not a small prize at all! I’m loving the keychains btw! You have such a great blog, thank you x10000000! i love this soo much 🙂 i truely hope i win but if i dont thank u for doing it anyway. is that an ice creamies lipsmacker? ive always wanted to try those. Thanks for the awesome giveaway! I’ve just discovered your blog. I’ve loved lip smackers since I was little! Such a fun giveaway! Also, cute updates to the blog. OH my gosh I’m so excited! Thanks for having this giveaway! Trying to win this for my girlfriend. Thankyou again for your help in tracking down the vague flavors I made mention of. Lipsmacker line was the first introduction to lip and beauty cosmetics when I was young, and the first thing I have introduced my daughter too! Cool site and giveaway! Thanks! These were all the rage back in my teen years, id love to win these and use them again they were so much fun! My boys love flavored lip balm and my nieces would go wild for all of the other goodies. Thank you so much for the giveaway! I think this is a great giveaway. The lip smackers will help my very dry lips. Looks like all kinds of flavors plus regular. I love Lip Smackers! I have used them since I was young and they are still a favorite! LipSmackers remind me of when I was a kid. We all used them. This is heaven to a lip balm/gloss junkie like me! Thank you for the chance to win! I love Lip Smackers! I read your site all the time, I check everyday. Thank you bunnycookie for doing this! Youve made me addicted again lol! Lip Smackers boy that brings back memories. My daughter is only two so she would probably eat it but I will definitely get her some when she’s a tad older. Cool giveaway! this would make a great birthday present for my niece! I love using Lip Smacker this product is my most favorite and have been using it for a while now. What an awesome Giveaway!! Thanks!!! My mom loves lip smackers. I would like to win this for her. Eeeee I want these so bad =) I love reading your blog and seeing the contest made me so happy. It’d make my summer. Found your webpage one evening several months ago when I was remembering the vintage Lip Smackers from my childhood and have been a reader since. I swear by this product and always include a handful as gifts to my loved ones. I have always enjoyed Bubble Gum, Dr. Pepper, and Apple. I have used them since the 70s and will never stop…they are on my nightstand, computer desk, purse, car… you name it! Thanks for keeping the nostalgia alive and having such a fun contest for your readers. I just love Lip Smackers! Thanks for the chance to win the amazing giveaway! Saw this on twitter, love smackers, didn’t know this blog existed but now i do. thank you!!! i can’t wait to see who wins. thank you! I really love their lip balms and surprisingly there nail polishes which i wish they would make large versions of because it is actually good stuff. THANKS!!! WONDERFUL prize! I’d love to win this. Thanks and God bless! This giveaway has already ended almost three years ago. I suggest trying to find a recent giveaway that you can have a chance to win. 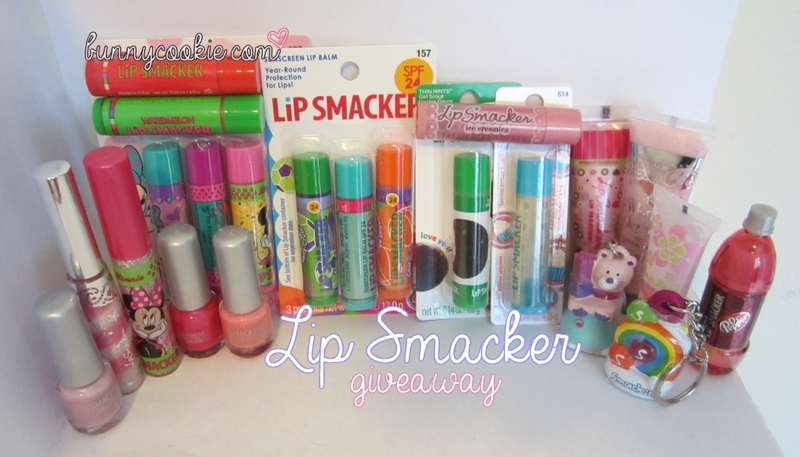 If you go to the most recent post on this blog, Bunny Cookie has explained how to get three free Lip Smackers if you join the Smoochie Club on Lip Smacker’s website.